WOUNDED WARRIORS RECEIVE A WARM WELCOME. 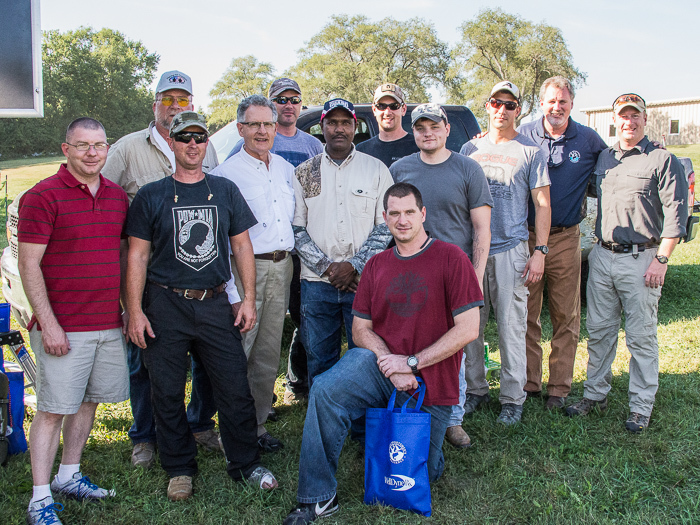 Joining in a group photo with the vets are David Willette, second from left (back row), representing Fishing for Freedom; Kinsey Robinson, International President of the Roofers union, fourth from left; and Fred Myers, USA Executive Director/CEO, second from right. 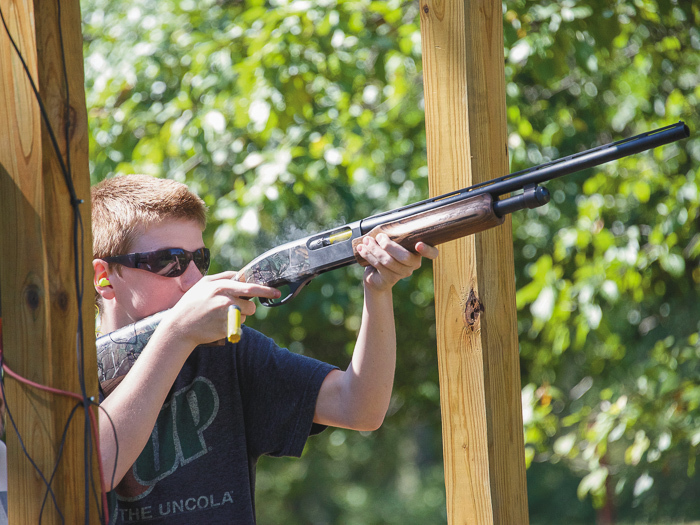 Parker Mendenhall, HOA youth winner, takes aim at a target. 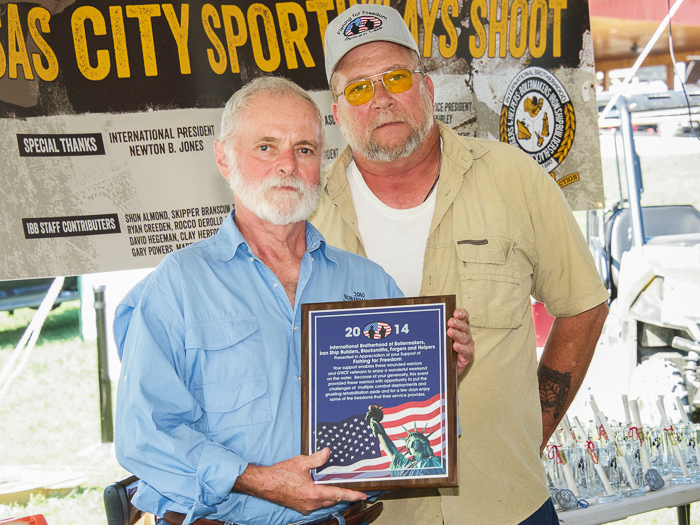 IST Bill Creeden accepts a plaque from Fishing for Freedom (F3) on behalf of the Brotherhood. At right is David Willette, an F3 volunteer coordinator and member of OPCMIA Local 518 in Independence, Mo. “That money will go back to work for sportsmen and sportswomen by helping fund the USA’s efforts to enhance public access to the outdoors, conserve wildlife habitat, restore America’s parks and pass on our outdoor heritage to the next generation,” says Fred Myers, the alliance’s executive director and CEO. Shooters representing Boilermakers Local 83 took top honors as the high over all (HOA) team with an impressive score of 449, while team member Kevin Jacobson also achieved the HOA Individual award by busting 97 clays. Other Local 83 team members included Shobe Smith, Craig McMichaels, Jimmy Wallace and James Adams. Also representing the Boilermakers union were teams from Local 40, Local 363, Local 374, Local 483, and various teams from the International. Hillary Feltrop, representing Heartland Electric, earned the HOA Ladies title with a score of 81. Cory Hadsall, shooting with Marco Consulting Group, went home with the HOA youth award in the 13-17 age group while Parker Mendenhall, representing Western Missouri & Kansas Laborers’ District Council, earned the HOA youth award for the 8-12 age group. “We owe special thanks to the Boilermakers International, especially International President Newton Jones and International Secretary-Treasurer William Creeden, for hosting this shoot and helping set new participation and financial records,” says Myers. Membership in the USA is free to all Boilermakers thanks to the union’s status as a charter organization. To find out more about the USA or to join, visit www.unionsportsmen.org. At least 10 Wounded Warriors also participated in the shoot. During the awards ceremony, Wounded Warriors support group Fishing for Freedom presented a plaque to the Boilermakers in appreciation of the union’s support for its program.